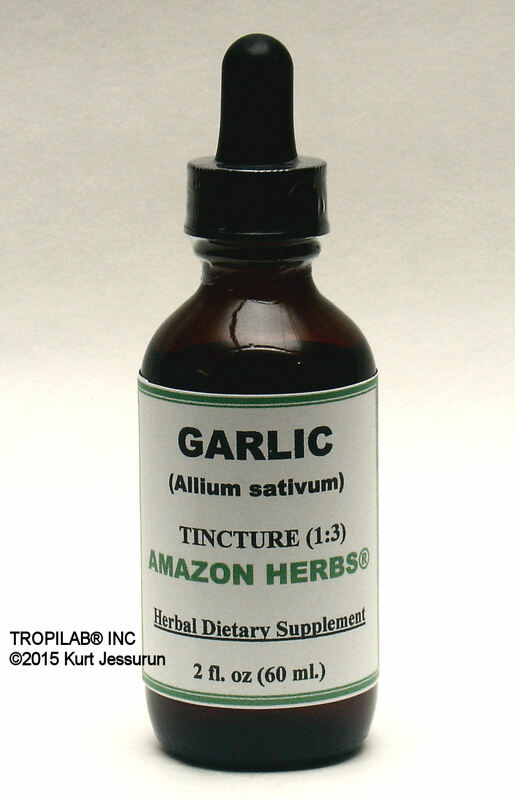 ﻿ GARLIC (ALLIUM SATIVUM) TINCTURE - antiviral & antifungal support - TROPILAB. Garlic has long been used in cuisines world-wide and for its pungent flavor as a seasoning or condiment. It is also known for its many medicinal applications and it is a very good source of thiosulfinates and sulfur compounds. Garlic has been used as both food and natural medicine in many cultures for thousands of years and exhibit extraordinary qualities and benefits. It is currently often used as an antithrombotic (reduces the formation of blood clots) and antioxidant herb to help prevent heart disease, atherosclerosis, and cancer. It is promoted for reducing high cholesterol (reduces the clotting tendency of platelets) and blood pressure levels. It may also be used against over-activity of the intestine and to improve the immune system and control blood sugar levels. Garlic’s antibiotic action is well-known and is useful for chest infections and colds; kills many types of bacteria, viruses, fungi and parasites. Garlic increases strength and stamina; it is also used as a natural aphrodisiac. Close relatives of garlic; onion, leek and chives, also have the same constituents and possess significant antibiotic properties as well the same anticancer and cardiovascular benefits. Active, organic sulfur compounds (S-alkylcysteine sulfoxides, derivatives of the amino acid cysteine such as alliin (S-allyl-L-cysteine sulfoxide). Allicin (diallyldisulfideS-oxide); Ajoene (an unsaturated sulfoxide disulfide). There are also other compounds in Garlic; to date over 100 compounds (among others quercetin) have been identified in garlic preparations. Garlic is an excellent source of minerals and vitamins. The bulbs are one of the richest sources of potassium, iron, copper calcium, magnesium, manganese, zinc, and selenium. Flavonoid anti-oxidants like carotene beta, zea-xanthin, and vitamins (vitamin-C, B-6). Allicin, an active principle of freshly crushed garlic has several very potent antimicrobial activities. In its pure form it was found to exhibit excellent antibacterial activity against a wide range of Gram-negative and Gram-positive bacteria, including multidrug-resistant enterotoxicogenic strains of Escherichia coli; antifungal activity, particularly against Candida albicans; antiparasitic activity, including some major human intestinal protozoan parasites (Entamoeba histolytica and Giardia lamblia); and antiviral activity. Due to these activities, it can be useful against stubborn infections such as bronchitis. The main antimicrobial effect of allicin (diallyl thiosulphinate) is due to its chemical reaction with thiol groups of various enzymes. Allicin is the primary ingredient found in garlic. After garlic is crushed, alliin is converted into allicin, the compound that gives garlic its strong smell and numerous health benefits. Garlic has been reported to protect against cardiovascular disease by reducing serum cholesterol concentrations and blood pressure and by inhibiting platelet aggregation. Further, garlic has antioxidant, antiviral and antifungal properties. Antioxidants help to destroy free radicals. Ajoene (an unsaturated sulfoxide disulfide), is the principal chemical responsible for garlic's anticoagulant properties. It is a component of allicin, a sulfinyl compound that gives garlic its strong odor and flavor. It is currently being developed as a pharmaceutical for the treatment of blood clotting disorders. This potent phytochemical might reduce the risk of stroke and heart disease. Topic application of ajoene has produced significant clinical response in patients with skin basal cell carcinoma. It was shown to inhibit proliferation and induce apoptosis of several human leukaemia CD34-negative cells including HL-60, U937, HEL and OCIM-1. Some studies report that topical application of garlic may help in fungal skin conditions (Tinea cruris, Tinea corporis) and may be used in ear infections. Due to the quercetin, garlic is powerful against allergies (anti-inflammatory). Allicin also decreases blood vessel stiffness by release of nitric oxide (NO); this reduces the total blood pressure. It also has fibrinolytic action in the blood vessels, which helps decrease the risk of coronary artery disease (CAD), peripheral vascular diseases (PVD) and stroke. Garlic (Allium sativum) and Onion (Allium cepa) are among the oldest of all cultivated plants. Both plants have been used as medicinal agents for thousands of years. Both garlic and onion have been shown to have applications as antimicrobial, antithrombotic, antitumor, hypolipidaemic, antiarthritic and hypoglycemic agents. Extensive research has focused on the beneficial and medicinal properties of both. The use of these agents as herbal tincture in the treatment and prevention of cardiovascular disease and cancer, is an area of considerable investigation and interest. Ajoene, a natural garlic compound; a new anti-leukemia agent for AML (acute myelogenous leukemia therapy). Several garlic compounds including allicin and its corresponding sulfide, inhibit proliferation and induce apoptosis of several human non-leukaemia malignant cells including breast, bladder, colorectal, hepatic, prostate cancer, lymphoma and skin tumour cell lines. Ajoene (4,5,9-trithiadodeca-1,6,11-triene-9-oxide) is a garlic-derived compound produced most efficiently from pure allicin and has the advantage of a greater chemical stability than allicin. Since AML is a heterogeneous malignant disease in which disease progression at the level of CD34-positive cells has a major impact on resistance to chemotherapy and relapse and the inability to undergo apoptosis is a crucial mechanism of multi-drug resistance in AML patients. Recent findings of the potent enhancing activity of ajoene on chemotherapy-induced apoptosis in CD34-positive resistant human myeloid leukemia cells suggest a novel promising role for the treatment of refractory and/or relapsed AML patients as well as elderly AML patients. Tincture: 1 - 3 ml. (1 - 3 full pipettes) daily. Garlic has a mild blood thinning- and laxative effect. When using anti-coagulant drugs (Warfarin, Coumadin®, Heparin®, Lovanox®, and Plavix® and Aspirin), avoid high doses. Avoid also high doses when pregnant. Garlic intolerance may result in heartburn. Ajoene (natural garlic compound): a new anti-leukaemia agent for AML therapy. Dept of Biological Chemistry, Weizmann Institute of Science, Rehovot 76100, Israel. 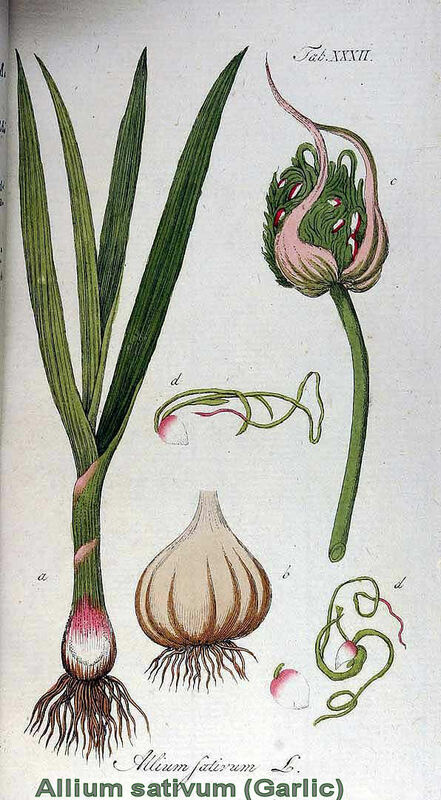 Garlic: the Science and Therapeutic Application of Allium sativaum L and Related Species, 2d ed. Koch HP, Lawson LD, eds. Baltimore: Williams and Wilkins, 1996. The antiatherosclerotic effect of Allium sativum. Koscielny J, Klüssendorf D, Latza R, Schmitt R, Radtke H, Siegel G, Kiesewetter H.
American Journal of Medicine (June 1994;94:632-5). Hypertension and hyperlipidemia: Garlic helps in mild cases. British Journal of Clinical Practice Symp 69 (Suppl. ): 3-6, 1990. Effects of garlic powder and garlic oil preparations on blood lipids, blood pressure and well being. Santos OS de A, et al. British Journal of Clinical Res 6: 91-100, 1995. You W-C, Blot WJ, Chang y-S, et al. Journal of the National Cancer Institute; 1989; 81: 162-164. Vegetables, fruit, and colon cancer in the Iowa Women's Health Study. Steinmetz KA, Kushi LH, bostick RM, et al. American Journal of Epidemiology; 1994; 139(1): 1-15. Garlic supplementation and lopoprotein oxidation susceptibility. Lipids 1993; 28 (5); 475-577. Garlic compounds protect vascular endothelial cells from oxidized low density lipoprotein-induced injury. Journal of Pharmacy and Pharmacology; 1997; 49: 908-911. Garlic and its significance for the prevention of cancer in humans: a critical review. Dorant E, van der Brandt PA, et al. British Journal of Cancer 1993;67:424-29. Effect of garlic on total serum cholesterol. A meta-analysis. Annual of Internal Medicine 119(7) Part 1: 599-605, 1993. Garlic, onion and cardiovascular risk factors: A review of the evidence from human experiments with emphasis on commercially available preparations. Kleijnen J, Knipschild P, Ter Riet G.
British Journal of Clinical Pharmacology 1989; 28:535-44. For many of the conditions discussed, treatment with prescription or over - the - counter medication (OTC) is also available.